The Walking Dead Showrunner elaborately speaks about the epic bloodbath in the show. As Daryl allowed Alpha’s daughter Lydia to accompany him and Connie in the process of rescuing Henry, they sure were aware of the re-precautions of their actions. Needless to say, they came on Sunday night’s episode, “The Calm Before.” In the awkward episode titled Fair of New Beginnings the Kingdom was infiltrated by a camouflaged Alpha and took several Hilltop residents hostage. 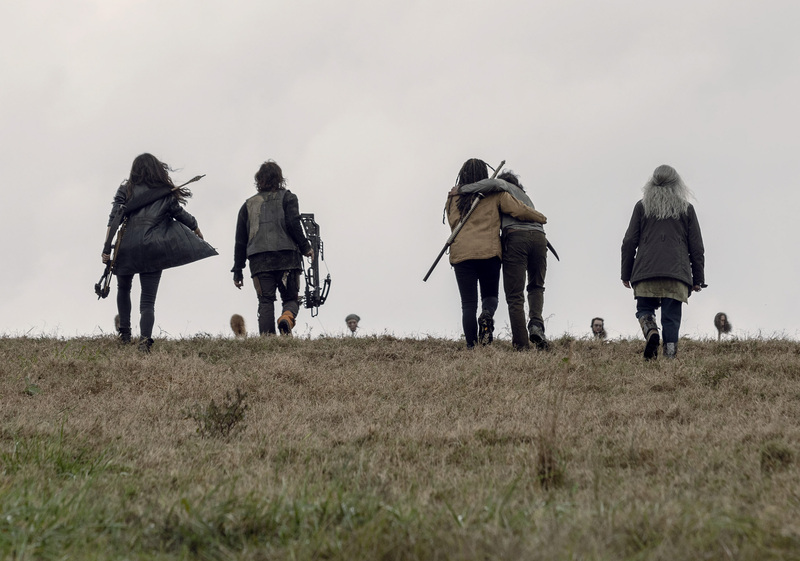 At the ending of the episode, 10 zombified heads on pikes signified a do-not-cross border for Daryl, Carol, Michonne, and Yumiko to find. The event is intuned with the happening of the comic book, however, the episode gave rise to 12 victims, with Tammy marking the only one being killed both in the comic and TV versions. Ezekiel and Rosita met their end in the comic pike line-up but made their way alive in the TV series despite the producers of the show cleverly let viewers dwell on the possibility that the King might be a victim here as well. Entertainment Weekly went to showrunner Angela Kang with some questions to find out how they settled on whose heads to chop off, how the victims were captured. While asked how did she come with the decision of letting Ezekiel and Rosita live while ending the terms of folks like Enid, Tara, and Henry, she replied with some diplomatic answer. King maintained that contracts are the main reasons that characters die and despite there is a loving environment in the show their term must end for story-related factors. "Some of the people who are on those pikes, we knew from the time we cast them that they were gonna be on the pikes. We specifically cast Brett Butler as Tammy knowing that she would wind up in that array. And we told her that at the time we cast her." King elaborated further giving a more character-based analysis explained that with Alpha's charge, in some ways, this is an act of terrorism. She then added the killings of the character are totally intuned with the flow of the character build up of Alpha. She concluded her answer to the question steering the reply to an optimistic and futuristic note explaining "there are certain stories that we’re planning into the future" and added that they sometimes have swapped out characters just for "those reasons." In the tete-a-tete, while faced with the question relating to confronting Katelyn Nacon and Alanna Masterson while telling that their time was up on the show, Angela gave a diplomatic answer stating that the production team made sure that the actors had an idea of the whole storyline of the series and are in on the twist and turns their characters were going through and stated that it helped them be mentally prepared for the exit. "Oh yeah, a little bit. I mean, that’s a little bit of the fun of the show. Obviously, doing this show, sometimes we’re very directly adapting from the comic, but we also deviate, and everybody knows that that’s kind of part of the deal with the show. For regular viewers, they might go like, 'Oh, maybe Ezekiel’s gonna die or not.' But for a comic fan, it means something different, and so it gives them a little moment to speculate as they’re watching the show, which we think is kind of fun." Then, answering the question asked about the procedures to make the Zombie head on the pike scene King maintained that Greg Nicotero cooked up some face molds and also added that visual effects were at play majority of the time while creating the scene. Although the killing is well justified and holds a major reason behind it, fans still cannot get their heads around the unpredictable twists in the series.